Q. When did multiple-color stained glass panels come into being? I thought I read that the term "stained glass" originally refered to glass that was stained with silver sulfide, resulting in panels that were predominantly yellow in color. If this is true, when did multiple-color panels come into being? Can you recommend any book titles that would address the cronology and history of this aspect of glass? Grisaille Lancet, France, about 1200-about 1260. 51.3.228. In brief, it is not known exactly when colored glass became widely used in windows, but according to one source, The Origins of Stained Glass by Sarah Brown (see bib for full citation), there is "literary evidence for the early use of decorative arrangements of coloured glass in the windows of churches....the Spanish poet Prudentius (348-c410) admiringly described the 'glass in colours without number' that he saw in the windows of the basilicas in Constantinople." Brown cites other instances as well in the literature of the 1st century a.d. Some archeological evidence has been found to show colored glass being used as early as the 6th century. Several fragments were found as well from what is believed to have been a 9th century reliquary. These are detailed in Brown's book. Early stained glass was made using a combination of colored glass painted with a vitreous paint, such as iron or copper oxide. 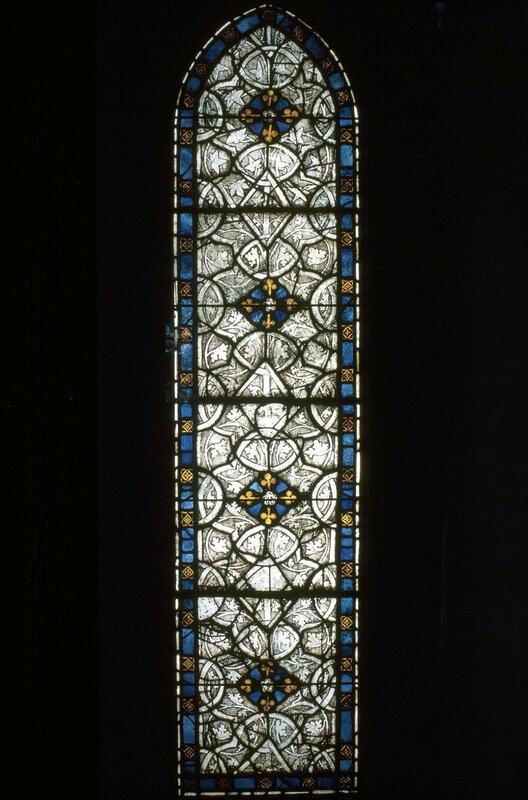 In the 1300s, silver stain (what you describe in your question) began to be used by stained glass artists. According to Raguin's book, Stained Glass from its origins to the present, silver stain is the only true "stain" in stained glass. During the firing of silver stain, the silver ions actually migrate into the glass, rather than remaining fused on the surface as is true with glass paints and enamels. Yellow was the resulting color on colorless glass, but depending on the composition of the glass, the result could be yellow, red or green. For example, silver stain applied to blue glass results in green. I am attaching a bibliography of materials on the origins and history of stained glass that you may find useful. The books on the bibliography will provide more detail on the points above. If these items are not available locally, check with your library's interlibrary loan department. It is likely that they can be borrowed from another regional library. If you wish to borrow copies of library items, please contact your local library. The Rakow Research Library will lend designated books from its collection and will send copies of articles requested by other libraries. Your library can request items through the OCLC WorldShare Interlibrary Loan (ILL) system or by direct request through email at ill@cmog.org. For more information, please see our ILL website.